Advances in Chemistry Research. 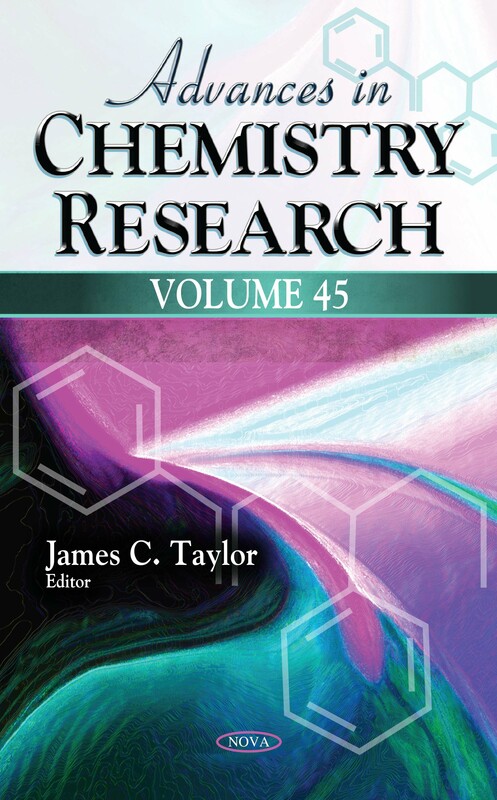 Volume 45 opens by discussing edible mushrooms, an interesting source of valuable compounds including sterols, fatty acids, carbohydrates, dietary fibers, vitamins, proteins, phenolic compounds, minerals and specific bioactive molecules. Conventional extraction methods using water or organic solvents, enzymes or physical treatments have been used for decades to recover different mushroom constituents. However, advanced green technologies using pressurized fluids such as supercritical fluid extraction or pressurized liquid extraction have emerged in the food field as an alternative to extract interesting compounds from different mushroom species. Thus, the authors summarize the approaches for extracting interesting molecules or specific fractions from edible mushrooms using pressurized fluids. This chapter also describes the different conditions such as technological parameters, solvents or processes that were selected to modulate the extraction yields and the bioactive properties of the obtained extracts. Following this, the Zhezkazgan deposit of cupriferous sandstones located in Kazakhstan was used as an example to consider two modern methods of rhenium recovery from a sulphuric acid scrub solution generated during the pyrometallurgical processing of copper sulphide ore – extraction method using trialkylamine and sorption method using weak base anion exchange resin (Purolite A170). The paper shows the possibility of using Purolite A170 to recover the perrhenate-ion by the anion exchange method, and the developed method of front-gradient cleaning allows quantitative removal of Purolite A170 resin saturated with rhenium from the phase as well as impurities by 92.0-99.8 %, including selenium by 99.2 %. The authors also aim to provide an overview of stimuli-triggered polypeptide-based hybrid hydrogels in which two components, peptides and proteins, are structural elements of the polymer network. Hydrogels derived from naturally occurring structural proteins are considered, followed by all-protein and peptide-based synthetic systems. Recent advances and challenges in the use of stimuli-responsive polymeric materials that are self-assembled from nanostructured building blocks are also reviewed. In the next chapter, an analysis is provided which demonstrates that the reaction mechanism and product configuration are electronically controlled. Studies of energy profiles for E1 reactions (dehydrohalogenation of secondary or tertiary alkyl halides and acid-catalyzed dehydration of secondary or tertiary alcohols) via a carbocation intermediate are discussed with the aid of the Bell-Evans-Polanyi principle. Finally, biological applications of elimination reactions are presented. Later, affinity chromatography is reviewed, as it has proved to be an effective technique for the recovery and purification of proteins. One of its main advantages is that it requires only one chromatographic step whereas other techniques require two or more. Another advantage is its ability to adsorb proteins present in samples at very low concentrations, thus avoiding the need to pre-concentrate the protein of interest or to eliminate potential interference. The authors show the efforts made so far to develop chromatographic matrices with immobilized triazine dyes for the purification of proteins with commercial value from different starting raw materials. Next, water/organic solvent sorption and residual enzyme activity was investigated to monitor preferential solvation and preferential hydration of protein macromolecules in the entire range of water content in organic liquids at 25 oC. The authors applied this approach to estimate protein destabilization/stabilization due to the preferential interactions of bovine pancreatic α-chymotrypsin with water-dimethyl sulfoxide (DMSO) mixtures. This approach facilitates the individual evaluation of the Gibbs energies of water, protein, and organic solvent. In the subsequent study, samples of gallium were synthesized and their catalytic activity in the oxidation of BTX was investigated. The physicochemical characterization shows that the inclusion of gallium in the mesoporous silica structure leads to an increase in the number of oxygen vacancies in the structure, which can result in an increase in the total and surface oxygen mobility. The results show the highest conversion for benzene, toluene and o-xylene. In situ leaching of rhenium from uranium ores, recovery of rhenium from pregnant leach liquor (extraction methods and sorption methods) and precipitation of rhenium from nitrate-sulfate eluates by water-soluble polyelectrolytes is reported on in the penultimate chapter. The methods of complex hydrometallurgical processing of pregnant leach liquors and barren solutions; formed during the in situ uranium leaching, including the rhenium sorption by using strong and weak base anion exchange resins, its extraction by phosphor- and amino-contained extractants and precipitation of rhenium by cationic water-soluble polyelectrolytes; are developed. In the final chapter, the authors summarize their recent works that improved protein detection and analysis method of microfluidic chip electrophoresis (MCE), aiming at solving the problems of inconvenience, safety of high voltage and adsorption of biological macromolecules. More specifically, a portable poly(dimethylsiloxane) (PDMS) MCE was fabricated for effective separation of proteins under a low voltage with a USB interface. These devices may have great potentials on the protein separation, analytical chemistry, agriculture, governance of environmental pollution and other fields.